"Ookiku Furikabutte: Natsu no Taikai-hen" or "The Big Windup: Summer Tournament Chapter" is the sequel to "Ookiku Furikabutte". Continuing from the first series, Nishura High plays in the National High School Baseball Championship's prefectural qualifiers in hopes of reaching the Koushien. As with the first series, this is only for baseball lovers since at least 80% of the screen time is either baseball game or people talking about baseball. If you can't sit through an entire baseball game, this is not a series for you. Watch "Cross Game" or "One Outs" instead. The previous series had introduction of characters and a demonstration of what a pitcher with perfect control combined with a highly analytical catcher can do as a battery. This time, it's about how reliance on the catcher and planned strategy can be beaten. I would say the logic and analysis of players are rational and interesting, but I felt how being able to read the next pitch gave players the ability to hit something like .800 batting average was unrealistic. Knowing the next pitch and its course is a huge advantage to batters, but it's not likely students in high schools (not even known to be powerhouses) are capable of driving them to exact positions they want. Slight improvement from first series. More details in the background and smoother motion, but overall same style and character design. Considering 2 years have passed... animation is unimpressive. BGM is pretty average. Unremarkable types that you tend to miss for the most part, but picks up in the inspirational moments. I seemed to notice the trumpet cheering squad more often, playing traditional theme music for high school baseball tournaments as well as summer Jpop like Natsumatsuri by Jitterin' Jinn / Whiteberry. Mihashi's voice was extremely annoying, but it was intended, and the seiyuu did a really fine job. Remaining cast also sounded like they should, but nothing out of the ordinary. There was a huge improvement in OP/ED in my opinion. Songs are a lot catchier, and has the summer feel to it with refreshing lyrics. Mihashi's character is so irritating! He gains a bit more confidence, and starts to open up a little bit, but it just takes so damn long for him to speak out every word! I guess this is intended since it makes me sympathize with Abe's frustration. This doesn't make Mihashi any less annoying though. Character development was done really well in this series. Nishiura had teamwork and trust on surface, which was nearly forged in an instant in last series, but this season is where the real trust is earned. Trust in teammates is always tested in times of difficulty and hardship. Players' doubts and the losing game this season leading to realization of mistake and improved team integrity was depicted really well. They really took their sweet time in developing the characters, dedicating a whole series for a single issue, just like the first series. I really need to re-watch all the series before the final season of "Ookiku Furikabutte" to get a whole picture of Mihashi's slow maturity. This is not really their fault, but it must be said: 13 episodes are not enough! 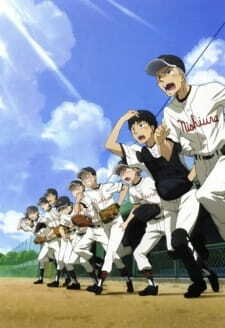 "Ookiku Furikabutte", at least so far, is unique in that it is truly a baseball anime, no romance, no school life, nothing else. However, it offers exceptionally thorough, albeit turtle-paced character development, analytic baseball, and couple of those heartwarming, inspirational moments. Fortunately, the final two episodes screamed of sequels, and I will definitely be looking forward to them. Ookiku Furikabutte: Natsu no Taikai Hen is the sequel, or the second season, of Ookiku Furikabutte. Of course, you will have to watch the first season before even thinking of trying to watch the sequel. If you liked the first season, then you will definitely enjoy this as well. It's a perfect continuation with the same story and characters, and not much changed, except for a few things. For example, since the two seasons were shown three years apart, one of the notable improvements is the art. Also, I disagree with other reviewers: you do not need to be a baseball fan to enjoy this series. I'm definitely not one, but I still enjoyed Ookiku Furikabutte. Many baseball terms were used, and I found myself searching through google just to understand the context. Still, what I really enjoyed about this anime was the character development. Like most anime that deals with team sports, the actual team members are what actually draws us to like the anime. And, in Ookiku Furikabutte, we see the characters grow, adapt, and interact. The team showcases unique but realistic individuals, as well as opposing teams with the same type of members. I'm not going to dwell to much on other aspects, because as I said, the bottom line is: if you enjoyed the first season, you'll definitely enjoy this one as well. Ookiku Furikabutte. For some odd reason, the first season of this show was like a crack addiction. I couldn't stop watching it and searching for pictures. So, when I found out there was a second season, I was really stoked! If you haven't watched the first season, Ookiku Furikabutte, you really need to to understand this anime. This is my first review ever, so I hope you all take that into mind when you read this! I also agree that you do not need to be a baseball lover at all to watch this series. I was always bored to death at my brother's baseball games before this series, and now I'm actually more interested in them. The reason I had been so interested in this series from the start was because of the story. I have never really been interested in sports anime before, but this one caught my eye. What I liked about it was the fact that not ever character was a power house. Nishiura did have some great players but not all of them were good, and even the best ones did have flaws. The story seems to not have changed too much from the first season, except for the fact that you meet some new side characters (like the parents). I gave the story an 8 mainly because of how realistic it was. I liked the fact that they didn't win every game: they lost some, too. And the way they dealt with their losses was very realistic, too. They bawled like little babies. It wasn't the best story, but was decently written to say the most. The art has really improved from the first season! While the eyes still creep me out a bit here and there, I find it more as an interesting touch. The animation is much more smoother in the second season and the drawings look far more crisp. While it's not the most fantastic I've ever seen, Ookiku Furikabutte's artwork is very expressive as well. For example, the eyes. The eye contact this anime has is very realistic and well done. I specifically remember a moment where Abe is thinking and looks into Mihashi's eyes, and when Mihashi realizes and looks back into his he immediately puts on more of a "grumpy" stare. Over all, I enjoyed the art work a lot. While the seiyuus are really good and the new opening and ending songs were definitely an improvement, the background music still irked me. Mainly it was because of the fact that the crowds were always cheering to the same exact music played by the band for about 5 or more episodes, but that was really it. Each voice actor played their part well, especially Mihashi's. That'd be a really tough role to play if I had to voice act as Mihashi! The characters in this series don't seem like much until you really dig through. At first, Mihashi Ren seems extremely annoying and completely lacking in self-confidence. Abe at first just seems to be, excuse my language, but a controlling prick. I had to really think to understand why I became to love such odd and annoying characters such as these two, and when I did I was surprised at the depth in them. Mihashi's main reason as to why he's so nervous, annoying and self-conscious is because of Mihoshi. Most people may find him annoying still, wondering why he's so "stupid" and "aggravating", but I was also badly ignored at my other school so I really sympathize with Mihashi. Also from being ignored I have become self-conscious and extremely nervous. Maybe not to his degree, but somewhere around there. Mihashi is definitely not as sharp as the average crayon, I'll tell you. You can pick up on that from his logic. "If I trust Abe, I'll be the best ace!". But it's not just his horrible logic that's making him think that way. It's because he lost all hope in pitching while he was in Mihoshi, and now he has to find someone or something to pitch for. He's allowed himself to become brainwashed in thinking that by following Abe's lead, he'll become a better pitcher. Abe is also a character I'd normally hate, but I actually really adore. Why? At first, he does indeed seem like a controlling prick. And while he is controlling, if you pay attention he's very nice. He cares a lot about Mihashi and wants to help him gain self confidence and become the great pitcher he wants to be, but is also too controlling of him. He is also controlling of Mihashi, telling him to only pitch what he says, because of his hurt ego from his past pitcher, Haruna. If you pay attention, it seems as though Abe is trying as hard as he can not to get hurt again. He also seems to never have understood how to show affection in the right way. On the outside, he appears very cold, calculating, negative and just... angry. On the inside, he's just a bit hurt, kind (although he'd probably never admit it), easily angered and desperately searching for someone to control to make himself feel better. The pitcher and the catcher in this series seem to be searching for someone who understands each other and emphasizes them. And, despite what they noticed, in the end they do find that once they open up more to each other. The character change in this anime is overwhelming around the end. Abe tells Mihashi to shake his head to his pitches after getting his knee badly hurt. This may seem like nothing, but Abe is actually loosening the chain on Mihashi and trying to help him further become a better pitcher. This shows he isn't as rude as you may think in the beginning. If he were he wouldn't care if Mihashi was getting hurt or not, but because he finally realized he was Abe decided to go and help him. Meanwhile, Mihashi is learning a bit more how to open up to others and is learning to rely on himself as a person and a pitcher, too. In the end it shows he is loosening up on his nervousness and he actually smiles. Abe is startled at this, noticing how different Mihashi appears when he is at ease. While I'm not a sports fan I found this anime to be quite interesting and a good watch. I even got excited while watching the games, which surprised me. Unfortunately, though, I was mainly watching for the character development, which didn't occur as often as the baseball games did. But, otherwise, it wasn't too bad at all. While I hold this anime close to my heart, I do admit that it has some flaws. So while I'd give it a 10 because it's one of my favorites, I'm going with an 8. The characters were definitely interesting, the story was decent and the art was odd. But, if you're looking for an interesting show, you should definitely watch this second season. It wraps up the show very nicely. DO NOT WATCH THIS unless you've seen the 1st season. + A much more comforting and fluid pace than it's preceding season. + Character growth for the most part. + Everyone who watches this should want to be Tajima, cause he's dope. - (Insert Name) has never batted in a real game? JEEZUS!! - Mihashi is still too much of an introvert. Final note: I don't even like watching baseball, yet this series is so engaging and involving that it made me watch consecutively. The best sports anime are about more than just the sport itself. They're about friendship, struggle, growth, and achieving your dreams. Here are 15 of the best.